The United States Securities and Exchange Commission (“SEC”) brought a case in a United States District Court. It obtained a successful result against one or more of the defendants in that case. 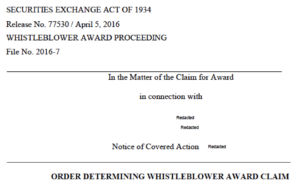 As a result, an SEC whistleblower award became available. Two separate people submitted claims for SEC whistleblower rewards in connection with that case. In its Preliminary Determination, the SEC’s Claims Review Staff (“CRS”) recommended that one of those people be granted an SEC whistleblower award. That claimant was identified as “Claimant 1”. The CRS recommended that the other applicant’s award claim be denied. In the Commission’s Order Determining Whistleblower Award Claim, it adopted the CRS’s recommendations as set forth in the Preliminary Determination. Claimant 1 was granted SEC whistleblower rewards for both the SEC’s case (the “Covered Action”) and for a related criminal case (the “Related Criminal Action”). The percentage amounts of Claimant 1’s two SEC whistleblower rewards were redacted in the Order. Due to the redactions, it cannot be determined whether the two awards were for the same percentage amounts or different percentage amounts. Monetary sanctions collected by the Commission in the Covered Action or by the [Redacted in original] in the Related Criminal Action that are deemed to satisfy or are in fact used to satisfy any payment obligations of the defendants in the other action shall not be double counted for purposes of paying an award; further, for purposes of calculating an award payment, any monetary sanctions collected in the manner just described shall be attributed, first, to the Commission’s Covered Action up to the full amount of monetary sanctions ordered in the Covered Action, with any remaining amounts attributed to the Related Criminal Action.